We invite you to visit one of the world’s wonders: the Iguazu Falls, a unique and impressive show that nobody can stop staring at. No trip to Argentina is complete without a visit to Iguazu Falls, which is a UNESCO World Heritage site and 2011 was named one of the 7 Wonders of the Natural World. 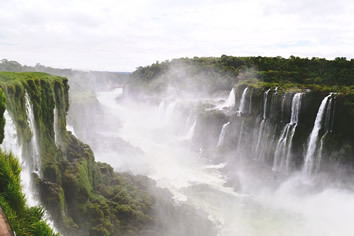 There are few sights more awe inspiring as Iguazu Falls. Stretching almost three kilometers and straddling both Argentina and Brazil their scale, power and beauty will not soon be forgotten. With us you will enjoy a 4 days and 3 nights’ package in selected hotels with an excellent service of international level. As we know about your demands we have chosen the best hotels in Puerto Iguazú (if you have any other in mind, don not hesitate to consult us). We offer you 3 hotel choices of different categories, with quality as a common factor. The excellent five-star Loi Suites Iguazu Hotel, as well as the amazing four-star Orquideas Palace Hotel and Raices Esturion Hotel, a three-star hotel that offers us much more than any other in its category. 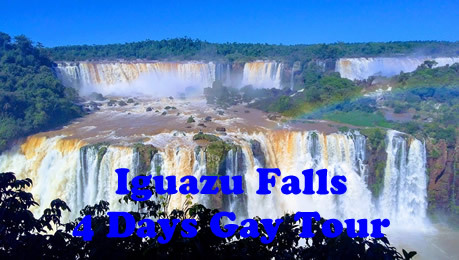 In this trip you will enjoy an unforgettable experience in an excursion that will show you the wonderful Iguazú Falls, both the Argentinean side and the Brazilian one. Declared a World Heritage site by UNESCO in 1984, Iguazu Falls is often revered as the world’s most spectacular waterfall. Situated on the border of the Brazilian state, Parana, and the Argentine province of Misiones, Iguazu Falls spans 1.7 miles (2.7km) in width, and features 275 individual waterfalls, with heights ranging from 196-270ft (60-82m). The name ‘Iguazu’ is loosely translated from the indigenous Guarani language as “big water”. Unsurprisingly, former first lady, Eleanor Roosevelt, reportedly exclaimed “Poor Niagara” upon seeing Iguazu Falls for the first time. 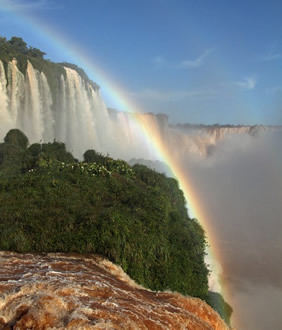 Iguazu Falls is undoubtedly one of the most spectacular treasures of our natural world. The falls form part of both the Iguacu National Park (Argentina) and the Iguazu National Park (Brazil), which have both been declared World Heritage sites. 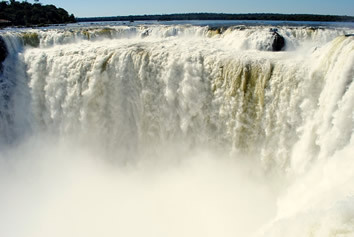 Approximately, 80% of the falls are located in Argentina and 20% in Brazil. Crossing over from one side of the falls to another is not difficult. The footpaths on the Brazilian side tend to focus more on reaching good vantage points to see the panorama, whilst the Argentinean side allows visitors to see the waterfall up-close. 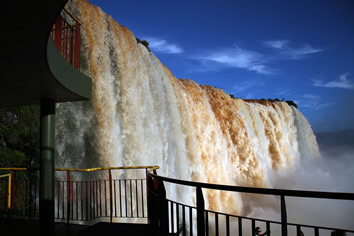 It is said that the Brazilian side is for viewing the falls and the Argentinean side is for experiencing them. The Argentinean side of Iguazu Falls offers tourists a number of vantage points to see incredible panoramic views, as well as the opportunity to view the falls from above. There are two different trails available on the Argentinean side of the falls; the upper falls, and the lower falls. The trail to the upper falls provides the opportunity to walk across several of the falls via catwalk, and to overlook the water flowing over the edges. The lower falls trail, on the other hand, offers some of the best close-up views of the falls. Both trails on the Argentinean side are best taken in the morning hours, when the sun is rising from behind and providing excellent lighting conditions. 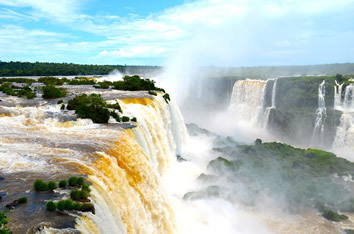 The Brazilian side offers the most complete panoramic views of Iguazu Falls. Ideally, you should visit in the morning, whilst the sun is behind you, lighting the falls. It is possible to cover the Brazilian side in just a few morning hours. As such, it is possible to visit both the Argentinean and Brazilian sides of Iguazu Falls, covering all vantage points, in just a day and a half. However, a visit to Iguazu Falls is certainly not an experience to be rushed, and so allowing for more time is recommended. The Devils Throat (or, Garganta del Diablo) is a U-shaped cliff, marking the border between the two countries. 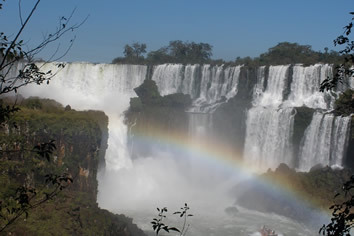 It is often considered to be the most impressive thing about Iguazu Falls. 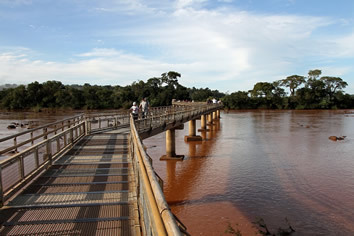 At over 260ft (80m) high, and 1.7mi (2.7km) wide, about half of the Iguazu Rivers water flow spills into the Devil’s throat. With water flowing from 3 sides, it offers visitors a 260-degree view of the waterfall. It is advised to view Devils Throat in the afternoon, as the sun will have risen above the falls by then. If you visit Devils Throat in the morning, the view will be disturbed by the glare of the sun. There is a lot to do at Iguazu Falls, and therefore a 1-day trip is not recommended, particularly when taking into consideration its remote location. One of the most exciting ways to experience the falls is by taking a jet boat tour. Jet boat tours take you really close to the Falls, so visitors should be prepared to get very wet. 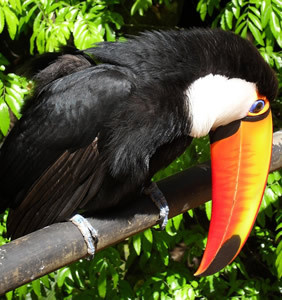 You can also get a helicopter ride over Iguazu Falls, to get a spectacular birds eye view. Jungle safari tours offer tourists the opportunity to be educated about the subtropical rainforests of the national park in a fun environment. For adrenaline junkies, rappelling is available at Iguazu Falls. 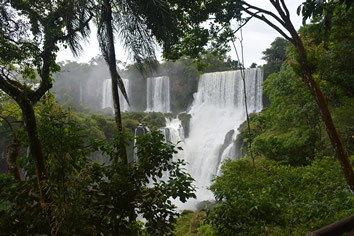 This involves a controlled descent using rope down the vertical cliff face on the Brazilian side of the Falls. 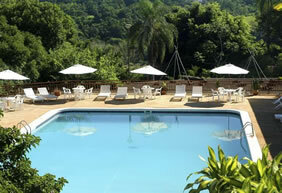 Orquideas Palace Hotel & Cabañas offers luxurious accommodations near the Iguazu Falls. 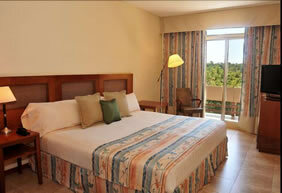 The 4-star hotel also has a swimming pool, fitness center and solarium. 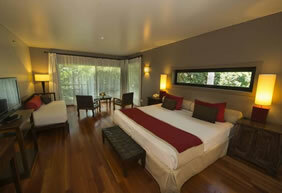 The rooms at Orquideas Palace Hotel & Cabañas are stylishly furnished and are of varying sizes. Each one has satellite TV, a mini bar and seating area. 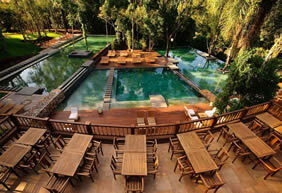 Located a few meters away from the pool, the Las Aaucarias Bar offers a wide selection of cocktails. 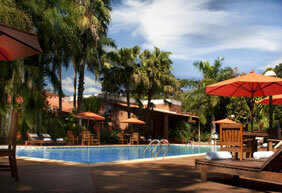 Orquideas Palace Hotel & Cabañas is centrally located to all the local attractions of Iguazu . There is a bus stop near the hotel. Featuring a spa and a lush garden with a swimming pool and a tennis court, Esturion Hotel offers rooms with Wi-Fi and cable TV, only a 15 minutes’ drive from the Iguazu Falls. There is an on-site restaurant and the city center is 601 m away. Landmark of the Three Frontiers is 250 m from the property. 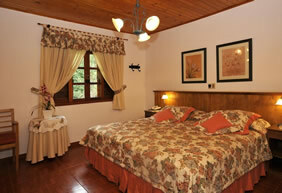 Rooms at Esturion are elegantly decorated and offer views of the river and garden. They feature mini-bars and air conditioning facilities. A daily buffet breakfast is served from 07:00 to 10:00, and a continental breakfast from 10:00 to 12:00 . Local and international dishes can be ordered at Caviar Restaurant, which features warm and picturesque décor. Drinks from the bar can be enjoyed on the terrace. Spa facilities include sauna and massage rooms. Guest can play tennis or table tennis. The 24-hour front desk can provide tourism to explore the area. Free outdoor parking is possible on site and is confirmed upon arrival (subject to availability). Room service is available with no extra cost.